The concept of peacemaking or HÃ³zhoji K’e NÃ¡hÃ³odleel goes back to the beginning of time and is embedded in the journey narrative. In fact, according to the journey narrative, the Holy People journeyed through four worlds. In the course of their journey, they came upon many problems, which were either caused naturally or caused by the Holy People. The problems had to be addressed and resolved before the journey continued. The problems could be addressed by the use of prayers, songs and offerings. 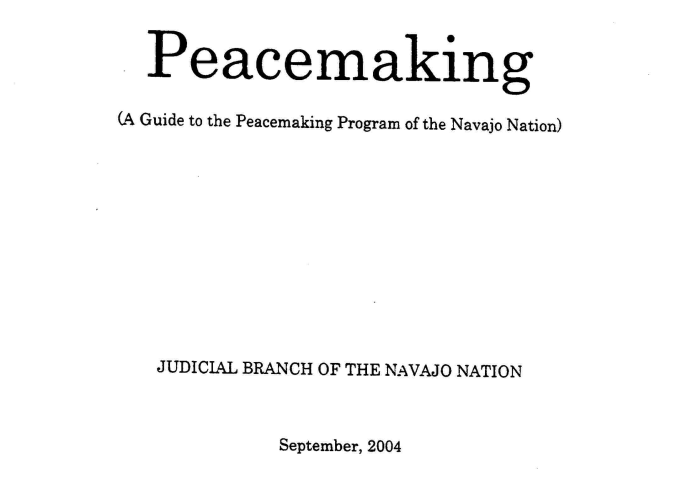 These remedies were incorporated into the DinÃ© Traditional Ceremonies. Another way to address the problems was to talk about them in a controlled way. This talking out became the DinÃ© peacemaking process.